Extracted birth record for the locality listed. ALEXANDER FALCONER MURISON’s father, Alexander Snr., was born in 1816 in New Deer. He was a Wright to trade, and a son of John Murison and Barbra Falconer, both also born in New Deer; John in 1773, and Barbra in 1785, who married in New Deer on the 30th December, 1813. ALEXANDER FALCONER MURISON’s mother Elspet, (also a Murison), was born in January, 1825 in Rathven, Aberdeen to William Murison and Elizabeth Catto, and she married Alexander Murison Snr. on the 7th of December,1845 in New Deer, Aberdeen, Scotland. Alexander Murison Snr. and Elspet had 5 children in New Deer, Alexander Falconer in 1847, William in 1848, Barbra in 1850, John Falconer in 1852, and George in 1854. ALEXANDER FALCONER MURISON was educated, initially at a Grammar School in Aberdeen where he boarded with Mr Alexander Thomson (Shop Porter) and Mrs Margaret Thomson in Maywell Street, Old Machar, and thereafter at the University of Aberdeen where he achieved an MA and a LLD. ALEXANDER FALCONER MURISON married Elizabeth Logan on the 18th of June, 1870 in Old Machar, Aberdeen, Scotland; Elizabeth having been born in New Deer in 1847. They had two children, Alexander Logan Murison 1871, and James William Murison in 1872, both at Old Machar. Alexander was actually an English Master at The Aberdeen Grammar school from 1869 to 1877. By 1881 he had moved to England and become Barrister-at-law, Middle Temple, London in 1881. Very quickly, in 1883, he was appointed Professor of Roman Law at University College London, a position which he held until retirement in 1925 along with the professorship of Jurisprudence from 1901 until 1925. This 1891 Census extract image provides a snapshot of the Murison family’s whereabouts in London. In addition, Alexander was Deputy Professor of Roman-Dutch Law from 1914 until 1924, Dean of the Faculty of Laws, 1912-1924, both at University College London, and also Dean of the Faculty of Laws, 1914-1918, at the University of London. He was Deputy Regius Professor of Civil Law and Deputy Reader in Roman Law at Oxford University from 1915 to 1919. From 1916 to 1917 he was President of the Society of Public Teachers of Law. He was Senator of the University of London from 1921 to 1924. He spent some years on the political and literary staff of the 'Daily Chronicle' of India, and in 1896 he stood in an election for the Lord Rectorship of Aberdeen University but lost marginally. He was editor of the 'Educational Times', 1902-1912. He was also an examiner for several universities. He also published many books during his life, mostly on Roman Law, but also some on Scottish history, two of which we make available for reading here v.i.z. ‘Sir William Wallace’ and ‘King Robert The Bruce’. The documentary authorities are, indeed, fragmentary, and exceptionally perplexing. Some are clearly trustworthy; many are conflicting, dissimulatory, falsified, false, biassed in all degrees, and full of inference and hearsay set forth in the guise of indubitable fact. The researches of English historians—even when they happen to be Scotsmen--have not yet rendered further investigation superfluous. The fact is, that a large critical undertaking must form the basis of any adequate account of Wallace. In a brief narrative the writer must resign himself to the simple if somewhat perilous course of telling his story as it has shaped itself in his mind during perusal of the available authorities, with but occasional and slight indications of the shaping process. The noble poem of Blind Harry, thanks largely to the ingenium perfervidum of the minstrel himself, has been much—we may say wholly—discredited as history. Harry has been very cavalierly dealt with, however; it is more by a grin than otherwise that he has been vanquished. Stevenson's tentative protest is here emphasised. For the present sketch, however, Harry is used rather by way of illustration than as a source of facts. He is cited without any claim to credence, except on grounds definitely specified. But such reservation is provisional, and conditioned by such rational criticism as may one day yet be applied. The citations in the text have been conservatively modernised. All students of Harry's poem owe their most grateful acknowledgments to Dr. James Moir and the Scottish Text Society. 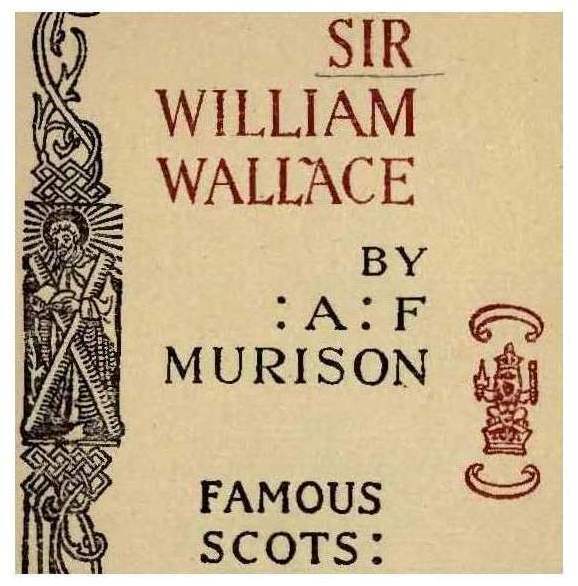 One is reluctant to believe that there are no more references to Wallace still lying dormant in the muniment rooms of Scottish families. One is no less reluctant to suppose that any patriotic Scot would leave a solitary corner of his muniments unsearched for every possible glint of light upon the great man that has stood forth for six centuries, and will in all probability stand forth for ever, as incomparably the most heroic and most fateful figure in the history of Scotland—a Hero and a Patriot second to none in the recorded history of the nations. THE present volume on King Robert the Bruce is the historical complement to the former volume on Sir William Wallace. Together they outline, from the standpoint of the leading spirits, the prolonged and successful struggle of the Scots against the unprovoked aggression of Edward I. and Edward II.—the most memorable episode in the history of Scotland. 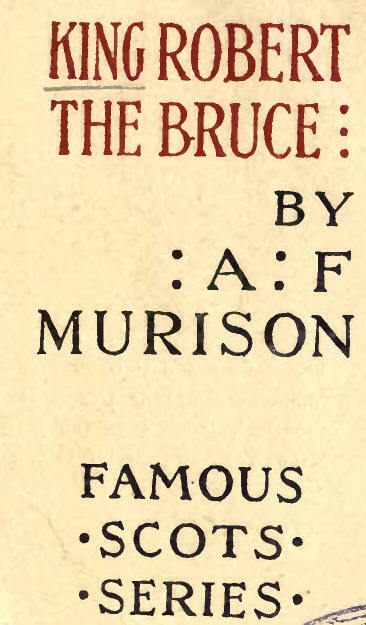 As in the story of Wallace, so in the story of Bruce, the narrative is based on the primary authorities. Happily State records and official papers supply much trustworthy material, which, furnishes also an invaluable test of the accuracy of the numerous and wayward race of chroniclers. Barbour's poem, with all its errors of fact and deflections of judgment, is eminently useful—in spite of the indulgence of historical criticism. There is no space here to set forth the long list of sources, or to attempt a formal estimate of their comparative value. Some of them appear incidentally in the text, though only where it seems absolutely necessary to name them. The expert knows them; the general reader will not miss them. Nor is there room for more than occasional argument on controverted points; it has very frequently been necessary to signify disapproval by mere silence. The writer, declining the guidance of modern historians, has formed his own conclusions on an independent study of the available materials. After due reduction of the exaggerated pedestal of Patriotism reared for Bruce by the indiscriminating, if not time-serving, eulogies of Barbour and Fordun, and maintained for some five centuries, the figure of the Hero still remains colossal: he completed the national deliverance. You can download this book in pdf format here! These are very interesting books as they were compiled by Alexander Murison when he was the Master of English at The Grammar School in Aberdeen. These are actual books studied by the pupils in school and contain lots of interesting information. Their intention was to not only teach the English language but also to educate on a whole series of topics through stories and poetry. There are thus many charming stories to be read in these readers and we certainly recommend a wee read of these which are in pdf format. To make these book easier to dip into we have made these available by book, by topic and you can read them on the Globe Readers Page.